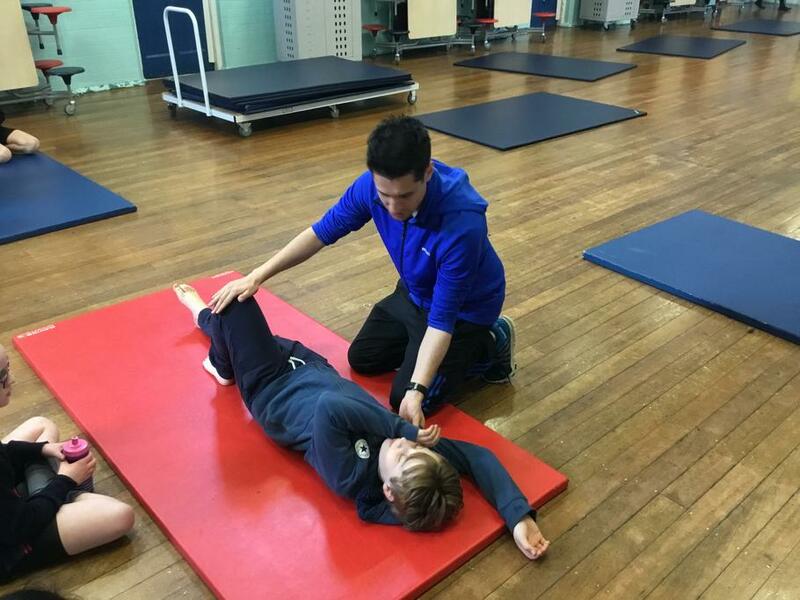 Stamford Park Junior School offers a variety of sports through our extensive PE curriculum. Children also have the opportunity to compete in a range of events during the year. Further information about our PE curriculum and sporting success will be shared below. Well what a week it's been for our netball teams... Our amazing B team also won their tournament yesterday at Ashton on Mersey! We are so impressed with them and all their hard work this year! Congratulations! 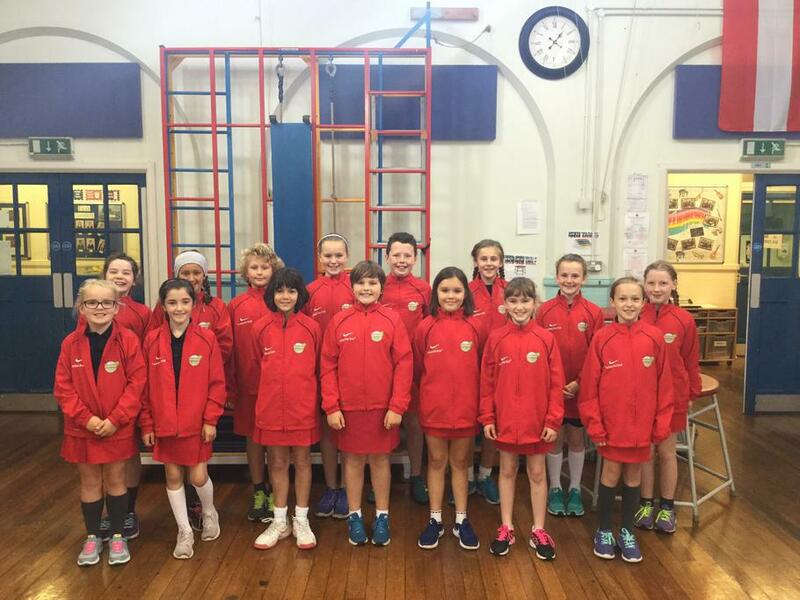 There is no stopping our awesome Netball team! We didn't think they were working quite hard enough, so we sent them to the Little Sports Coaching Netball tournament at the Armitage Centre in Manchester. They smashed the competition winning the final in convincing fashion 6-2! 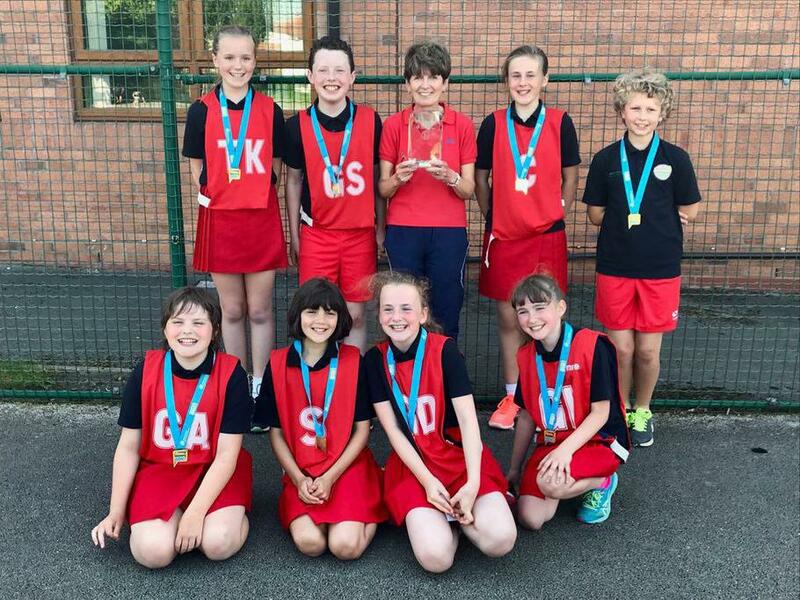 A huge congratulations to our fantastic netball team who, after months of tough matches, won the Altrincham & Hale Netball League last night! They will now go on to take part in the Trafford League! A big thank you as well to our brilliant coach Suzanne for all her hard work. Our Change 4 Life club has started again this half term and the children are having a great time. This club aims to encourage them to make healthy lifestyle choices and to try new sports. Last week, they were making healthy paninis and looking at different ways they could replace unhealthy foods in their diets. 104 teams entered The Premier League Primary Stars 6-a-side Girls Football Tournament. These absolute stars managed to make it to the last 11! They have shown great friendship, teamwork and resilience throughout their tournament run and have improved their football both individually and as a team no end. We look forward to seeing what more they can achieve in the upcoming fixtures and tournaments! 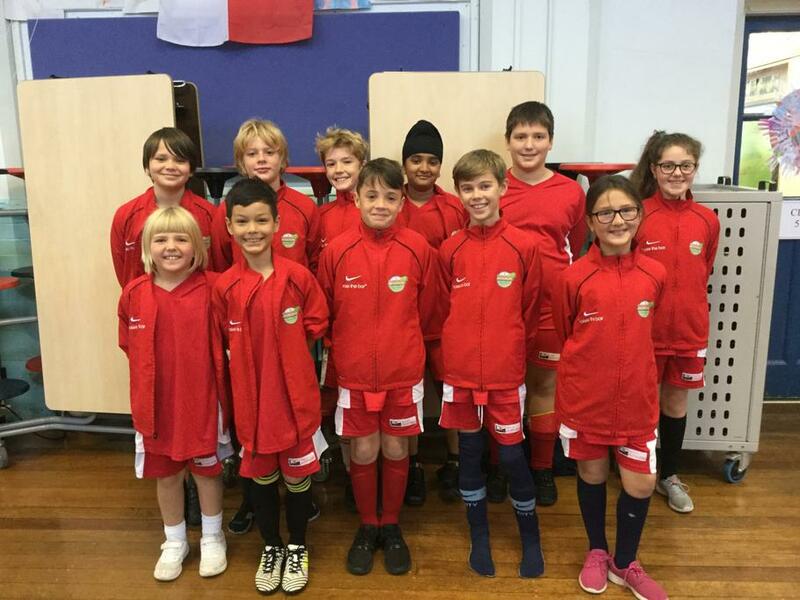 A massive well done, on a fantastic performance, to the Year 5 Handball team that went to Sale High School this afternoon to play in a 16 team tournament! This was the first ever Handball tournament for us and we managed to grab 3rd in our tournament only losing by golden goal in the semi-final. We have been learning the game of Handball during PE lessons recently; it was great to see the skills put into practice! 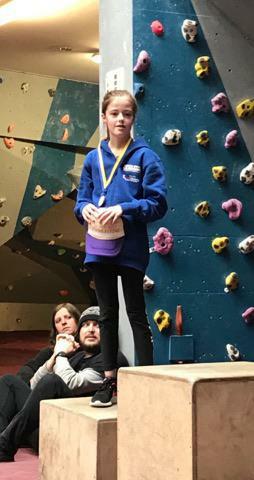 A huge congratulations to one of our Year 6 pupils who took part in her first regional rope climbing competition on Saturday for the North West and the Lakes area. She did tremendously well to secure fourth place after completing five challenging climbs and coming top in four of them! We are looking forward to offering some of our Year 6 children the opportunity to attend an introductory bouldering session in the summer term, where this child will be leading part of the session and demonstrating her skills! 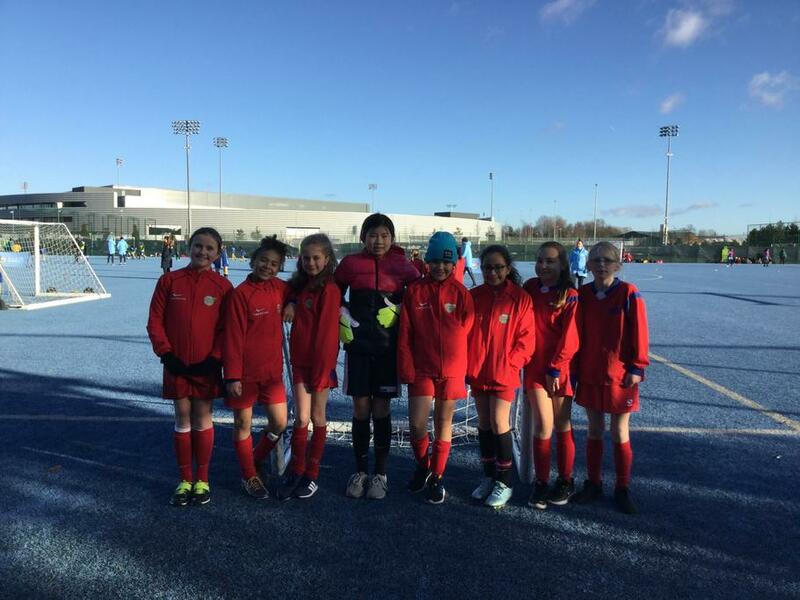 A huge well done to our Year 5 and 6 girls who braved the freezing cold temperatures yesterday to take part in a football tournament at the Etihad Stadium. They finished runners up in their group so we are keeping everything crossed that they make the next round! Congratulations to our fantastic girls' football team for their amazing win at the AFC football tournament today! They played extremely well and we are so very proud of them for coming first in the whole tournament - you little stars!!! A huge well done to the football team that attended the Etihad Stadium this morning to take part in a tournament. They made it to the final and were sadly beaten by another team. They finished in a very respectable second place so well done to them all! 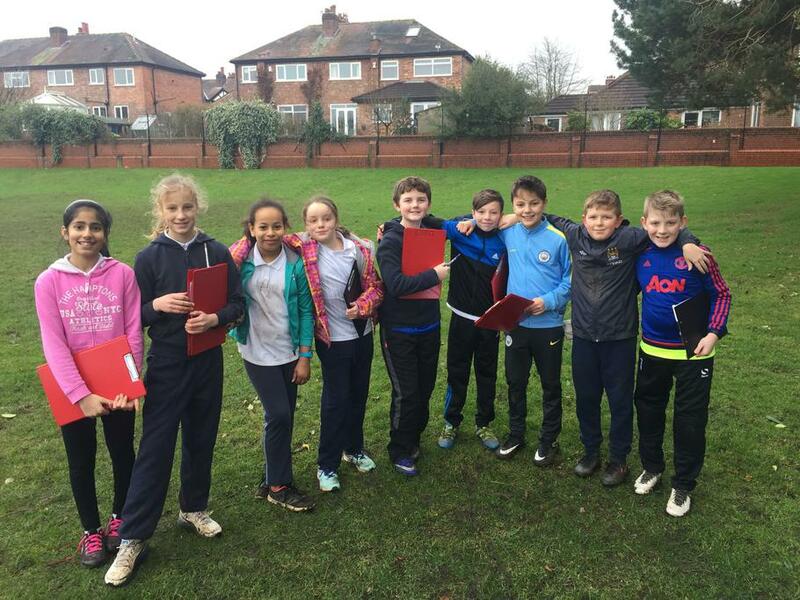 A huge thank you to a Year 3 parent for sending in this photo of our dedicated cross country team, who were racing on Saturday morning at John Leigh Park. What beautiful weather they had! If your child is interested in joining the cross country club, please contact Mrs Rainford for further information. A huge well done to our girls who took part in the first football league event of the academic year. They all played superbly well and enjoyed playing in the sunshine too (possibly for the last time this year)! Thank you to Mrs Barke for sending in the photos! 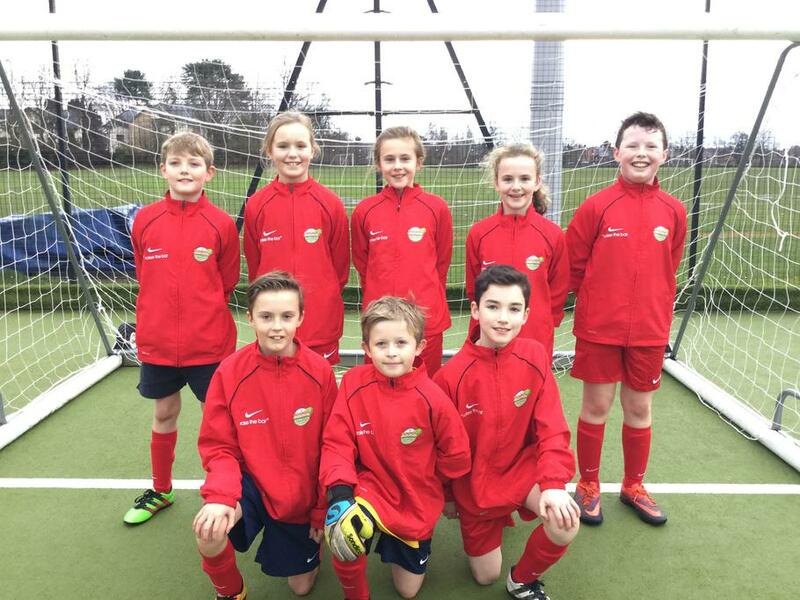 Good luck to our mixed football team who are attending a football tournament this afternoon. We've got two other football tournaments taking place after school today too; it's a very busy day for football! Good luck to them all! Our netball teams look so smart in their brand new kit tonight! Good luck to all the children in their first match of the season! Our Year 5 children have had a brilliant morning today. They've been organising and running a sports morning for the Year 2 children at Stamford Park Infant School. 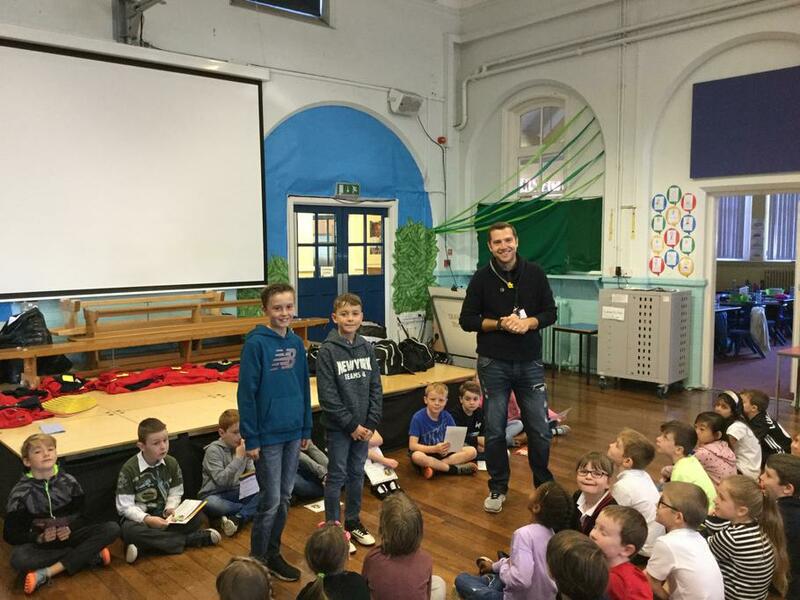 Well done to all the children who took part and developed their leadership skills. Next week is Sports Week and we have an exciting timetable of events for the children; please see the timetable below for more information (in addition to your child's usual PE slots). Children must have their PE kit in school every day, as sporting events will take place every single day. We hope to see you all at Sports Day on Tuesday 26th June at 9.30am. 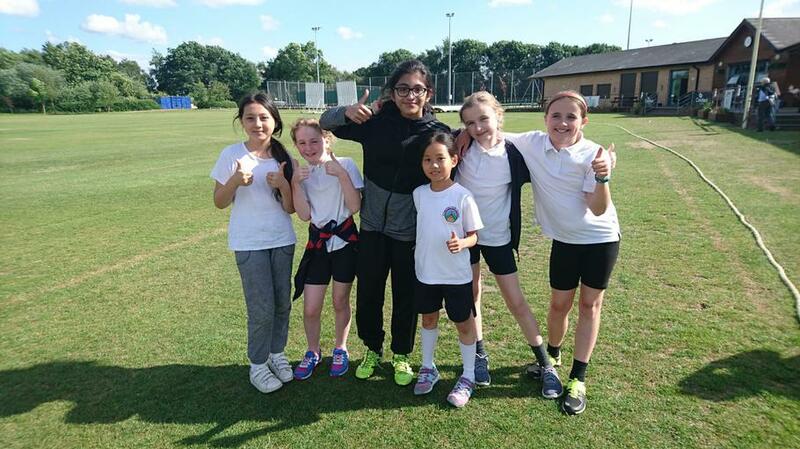 A huge well done to the girls who played in the Trafford Cricket League last night. 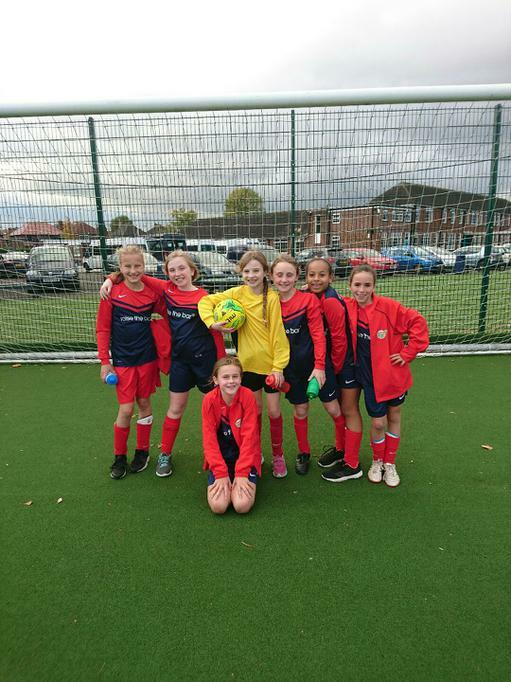 Mrs Cronshaw attended the event and reported that the girls played extremely well and really supported each other - well done to everyone who played! 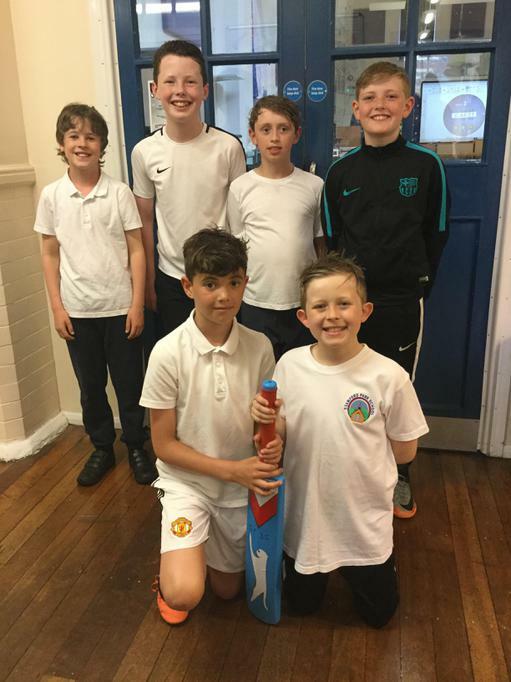 Last night, some of our boys took part in the first matches of the Trafford Cricket League. They played superbly and won all three of their matches - congratulations to them! Our girls have their second set of matches after half term and we will be reporting on their success very soon! 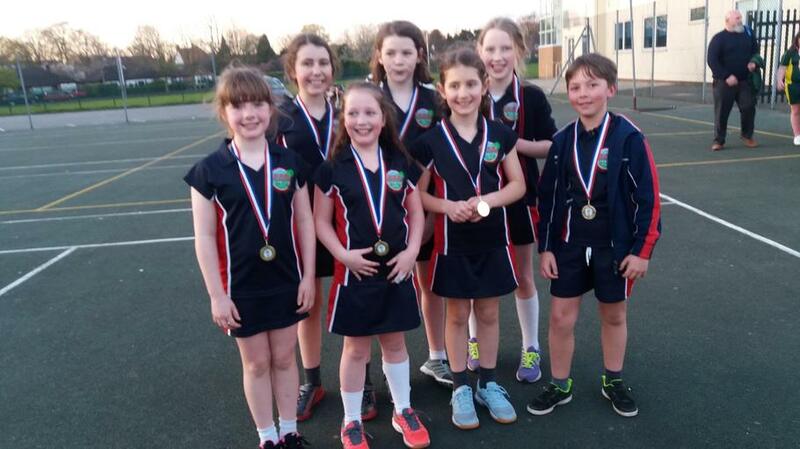 A huge congratulations to our Year 6 netball team! 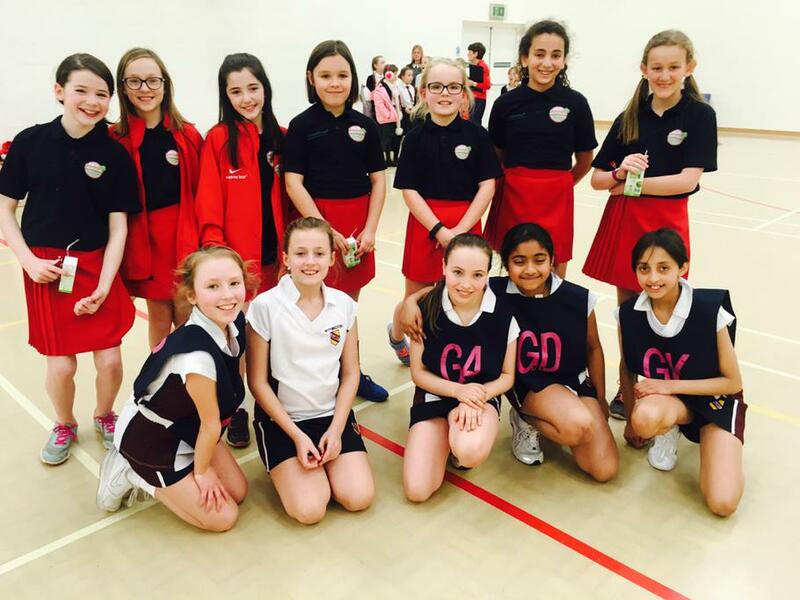 Last night, they won the High 5 Trafford Netball Final! They will now progress to the regional finals in early July. We are tremendously proud of them as SPJS have never reached the regional finals before! 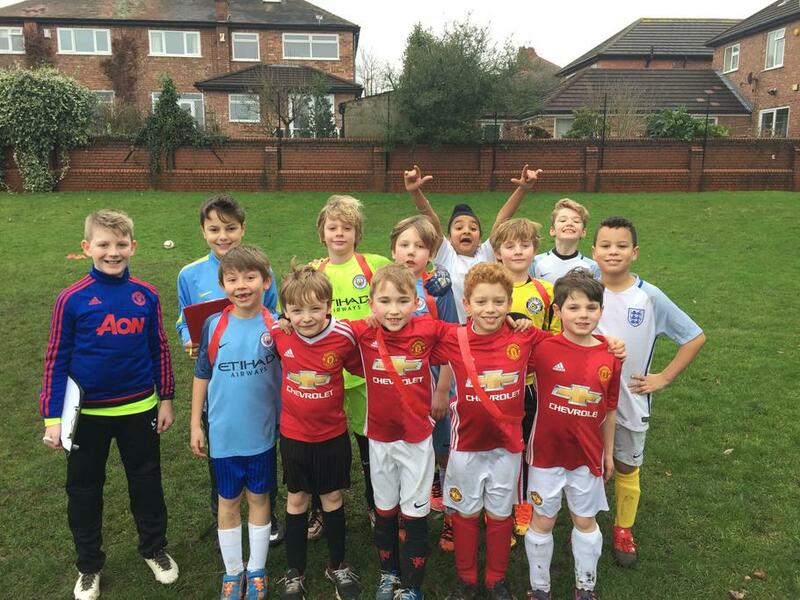 Yesterday, members of our Year 3 and Year 4 football teams participated in the annual Altrincham Football Club tournament. All children played really well and we are immensely proud of them. Our Year 3 team finished in third position and our Year 4 team finished in second position - a huge well done to all the children who took part! 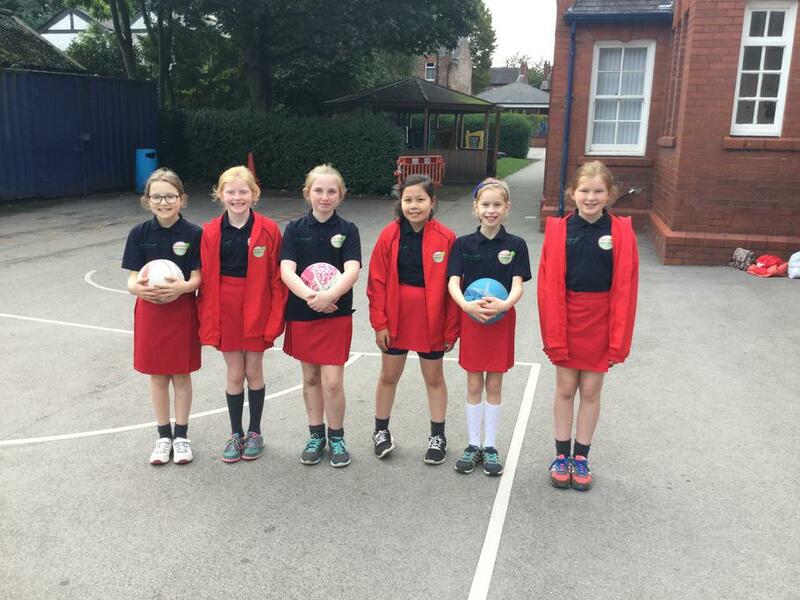 Over the past two weeks, our Year 6 netball team have been participating in a South Trafford Netball Tournament. After eight matches, our amazing team were undefeated and won the whole tournament with a fantastic 40 points! They will now progress to the Trafford final at the end of May. Congratulations to everyone who took part! Well done to one of our very talented Year 5 pupils who was awarded a silver medal in the Key Stage 2 category in the Greater Manchester Schools Climbing Competition this week. What a huge accomplishment! A huge congratulations to our amazing netball team for winning the 2017 / 2018 netball league tonight! They have played superbly throughout the past six months and we are very proud of them all! 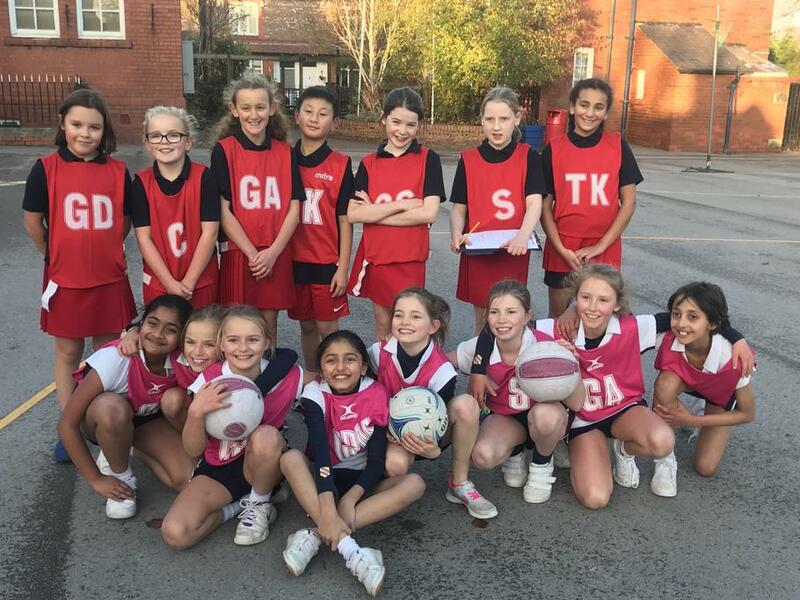 A huge well done to our Year 5 and Year 6 netball teams who visited Withington on Friday afternoon for a series of friendly matches. All the children played brilliantly and our Year 6 team won 19-7 - congratulations to everyone who took part! Congratulations to our fabulous girl's swimming team (from Year 4 and Year 5) for achieving bronze in the Trafford School's swimming finals. Well done to all those who participated in the event. 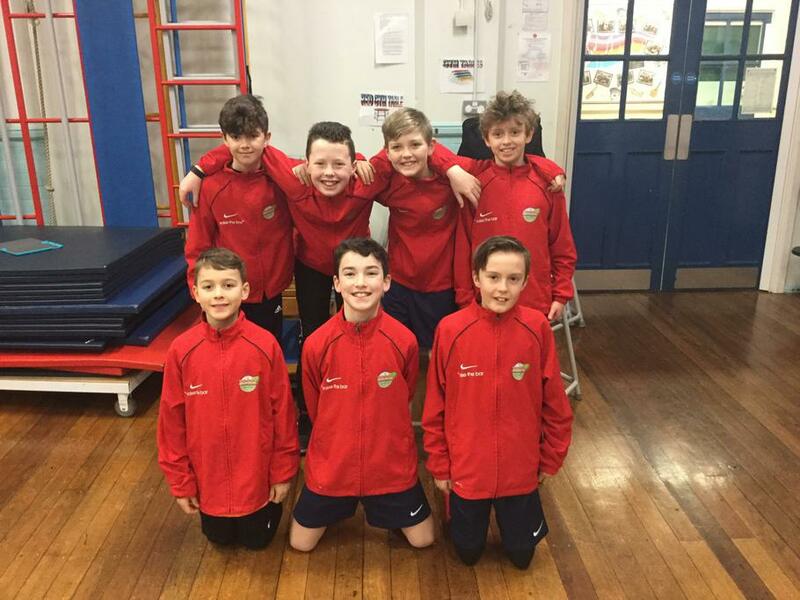 Good luck to the boys from our Year 6 football squad that are on their way right now to compete in the Manchester City Football Club "Primary Stars Football Tournament" at City Football Academy this morning. There was lots of excitement for this event! 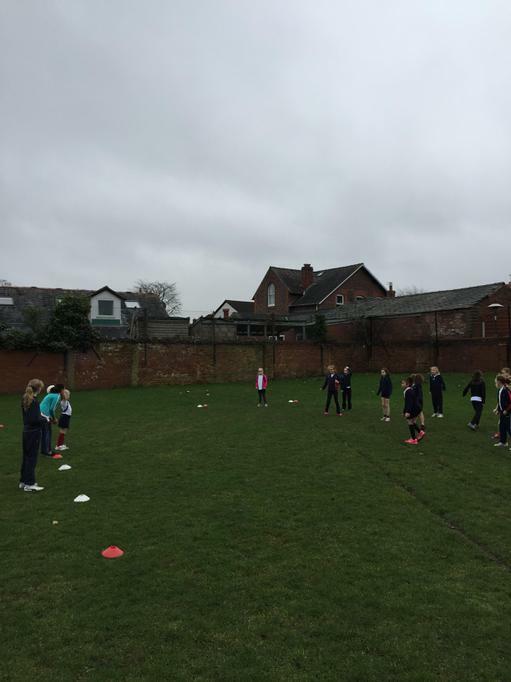 This week, some of our Year 3 children have participated in tennis workshops, in conjunction with the Ryder Tennis Cup and Hale Lawn Tennis Club. Despite the very chilly weather, they had a brilliant time and were all rewarded with a tennis racket! 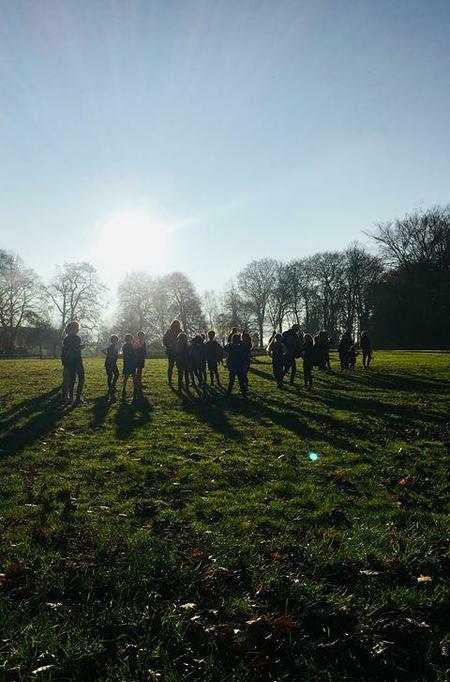 Last week, a netball team came to visit us from Withington Girls' School. 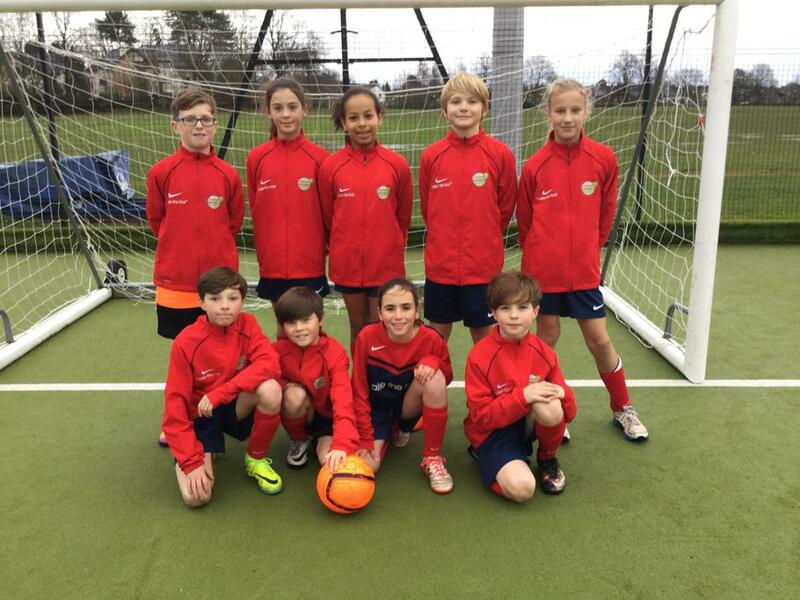 Our Year 5 team really enjoyed having the chance to play in a match. 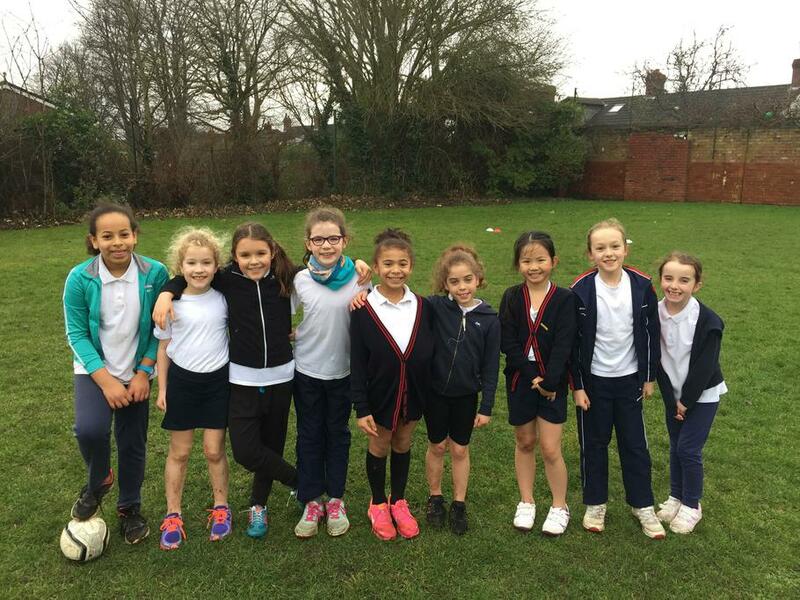 This term, our Year 4, 5 and 6 netball teams have all had the opportunity to complete in netball matches. Tonight was our 1st hockey night of the year down at Timperley Sports Centre. I was extremely pleased with their team effort, especially as we had many children who haven't played in this team before. We won the 1st 2 games (both 2-0) and lost the last one (3-1). Well done and thank you to the parents who came down to support us (in the rain...as usual!). 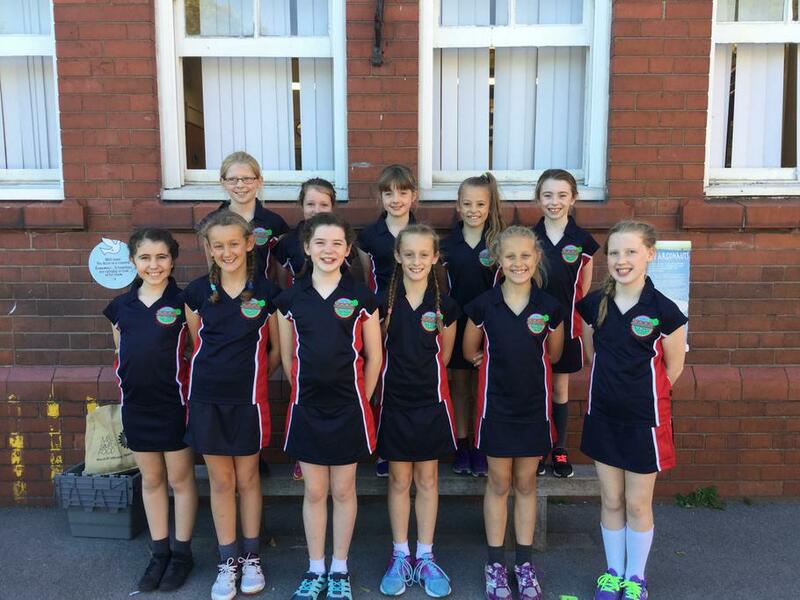 Our netball teams are looking very smart today ready for their matches against Bowden Church School. 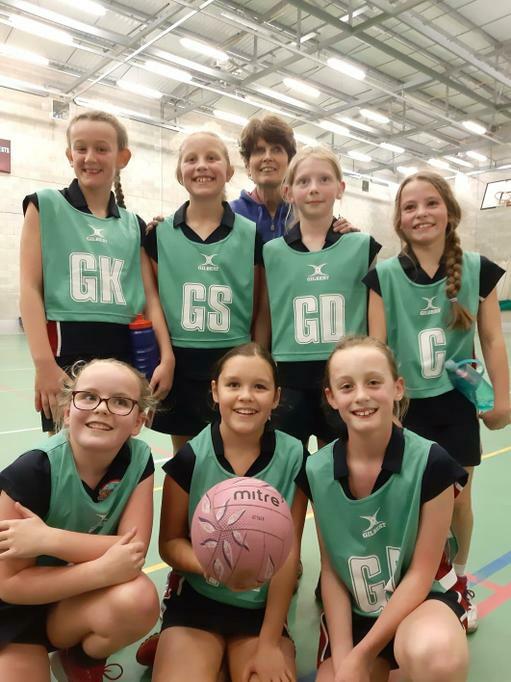 The netball league starts next week too so we would like to wish them all good luck for all of their upcoming league matches too! Today we announced our football captains (for the boys' team) for this year during assembly. A huge congratulations to both boys and good luck on leading your squad this year; we look forward to hearing your future match reports in assembly. Today, our Year 5 children have planned and delivered a sports morning for Year 2 children at Stamford Park Infant School. The event was a huge success with Year 2 getting to try out new activities and games, while Year 5 children developed their leadership skills. Many thanks to all the children and staff involved in this morning. We hope to repeat it very soon! We are very excited to be working in partnership with Hale Lawn Tennis Club this year. Our children are enjoying some tennis days at the club during sports week this week. In addition, our Year 3 children are also having a great time accessing free tennis coaching on a Friday, as supported by the Ryder Tennis Cup. Over the course of the year, we've been delighted to send different groups of children to have a six week taster course of tennis. Many thanks for Hale Lawn Tennis Club for giving us this chance. 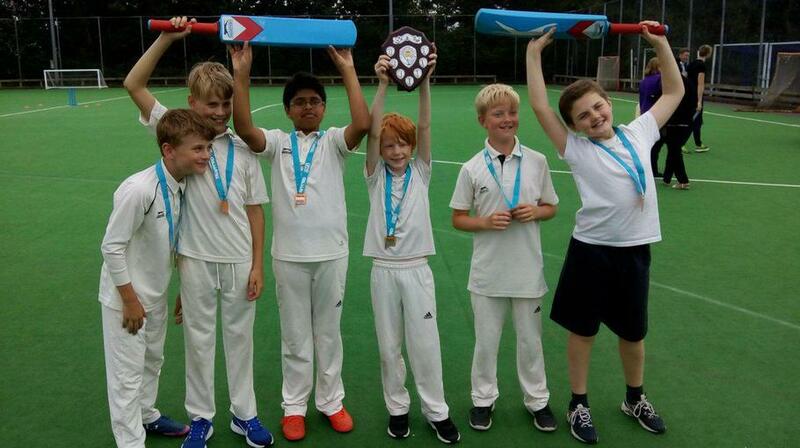 A huge congratulations to our Year 6 Cricket team, who won the Trafford Cricket League yesterday! Over a number of weeks, they have repeatedly played to a very high standard. Well done boys on bringing the shield back for yet another year! 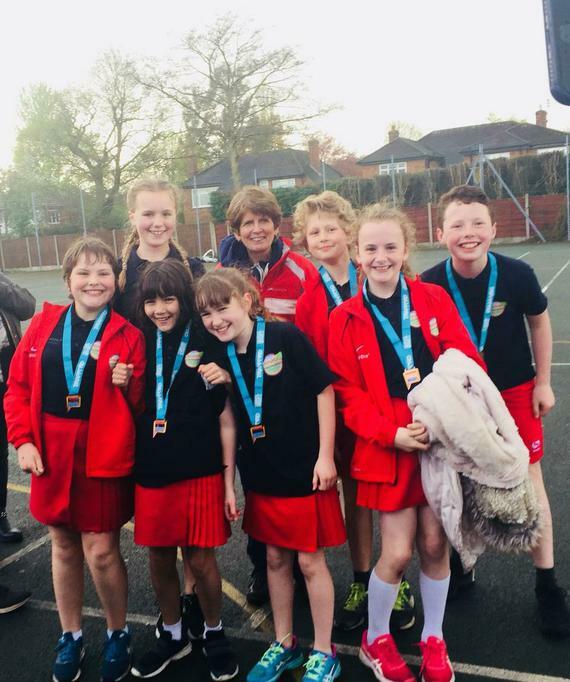 Last weekend, we sent a team of Year 3 children, a team of Year 4 children and two teams of Year 5 children to a tennis tournament at Bowdon Lawn Tennis Club. The children all played really well and the coaches there commented on their superb attitude. We are now furthering our links with Bowdon Lawn Tennis Club as they are delivering tennis coaching to some of our Lower Juniors every Tuesday morning. Tennis is also one of the sports that will feature quite heavily in our Sports Week at the end of June. 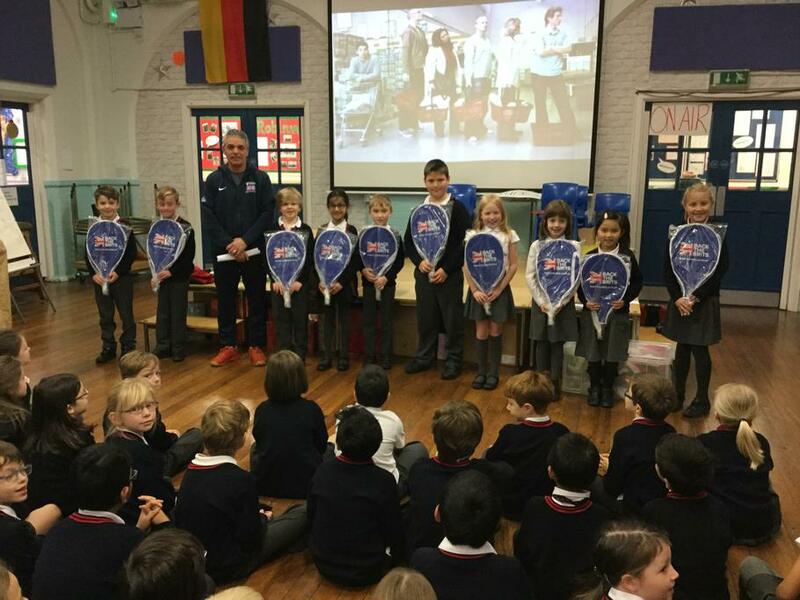 At Stamford Park Junior School, we are always looking to introduce new and exciting sports to the children. This afternoon, Altrincham Football Club came in to run some futsal taster sessions for Yrs 3-5. 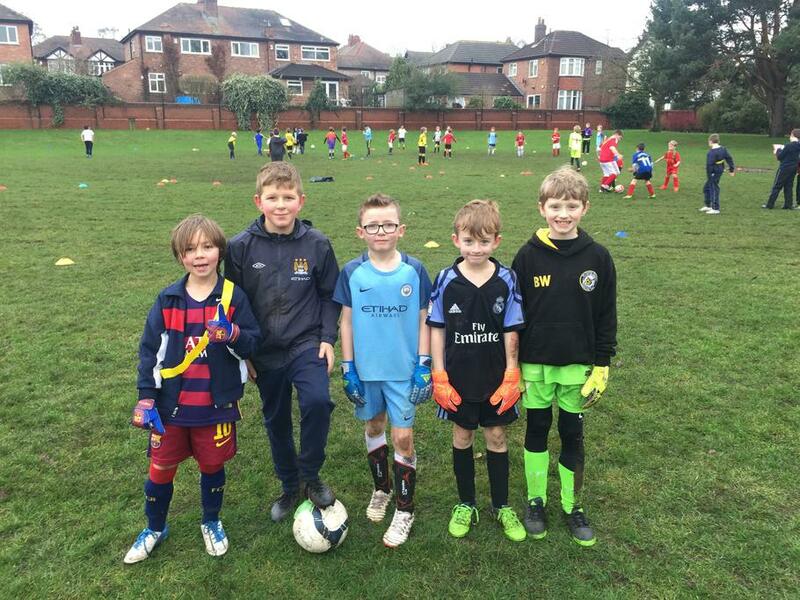 The children really enjoyed the opportunity to try a new sport and we are now looking at introducing it into our curriculum and as a club in the coming half term. 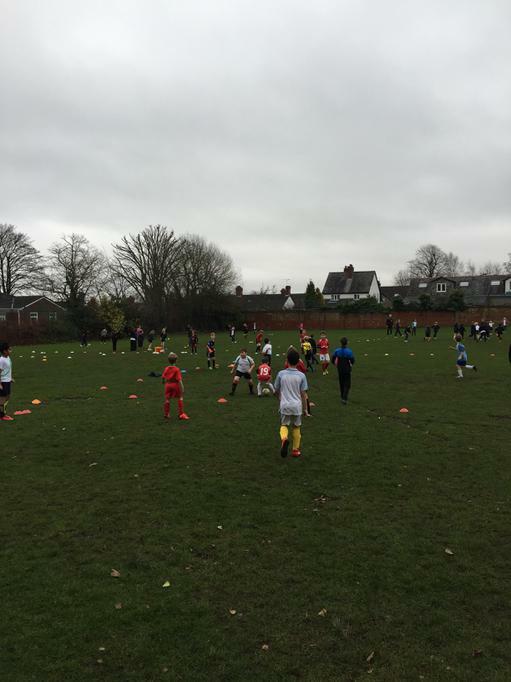 Yesterday, our very talented Year 3 and 4 footballers took part in the annual Altrincham Football Club tournament. Both teams played tremendously well and Year 4 managed to win the whole competition. A huge congratulations to all the children involved! In addition, many thanks to AFC for hosting the event and to the Year 6 coaches who supported the teams at the tournament. Before the Easter break, 5 children represented Stamford Park Junior School at the Greater Manchester Schools' climbing competition. The children displayed amazing strength whilst on the wall, but also fantastic team work and support for each other from the ground. Well done to everyone who took part. Tonight was the last of this year's hockey tournaments. The team played well and have shown how their skills have developed over the last few months. Thank you to all the parents who have come down and supported us, despite there being rather a large chance of rain! 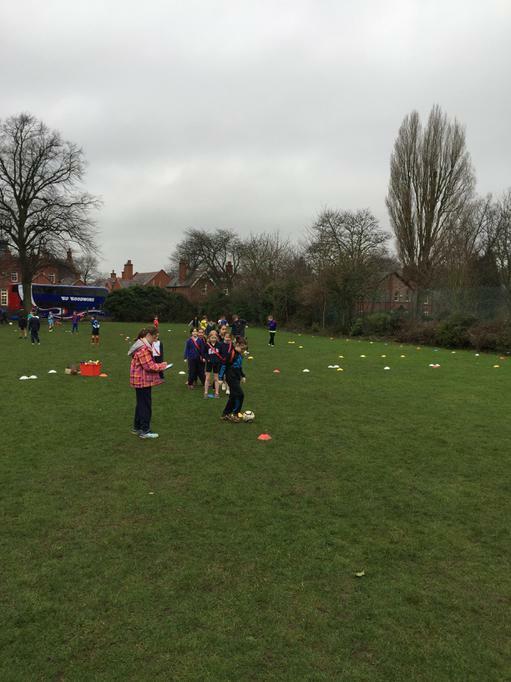 At Stamford Park Junior School, there are a wide range of sports on offer for the children to take part in. One sport that has always proved extremely popular is our fencing club, provided by Salle Kiss Fencing Club. At the weekend, two of our talented children participated in the School Fencing Tournament. Both boys performed superbly and one of them came away with the silver medal. 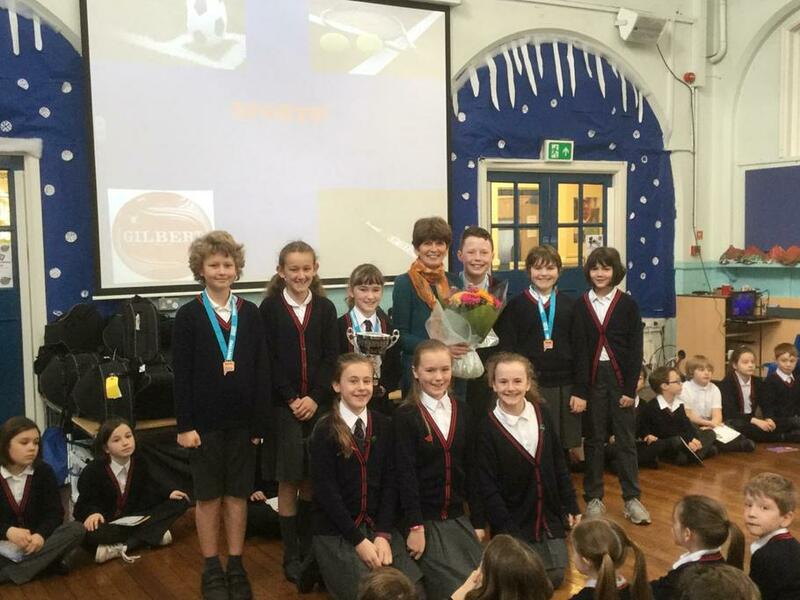 Congratulations to both of the boys and to all the children who have taken part in previous fencing competitions. 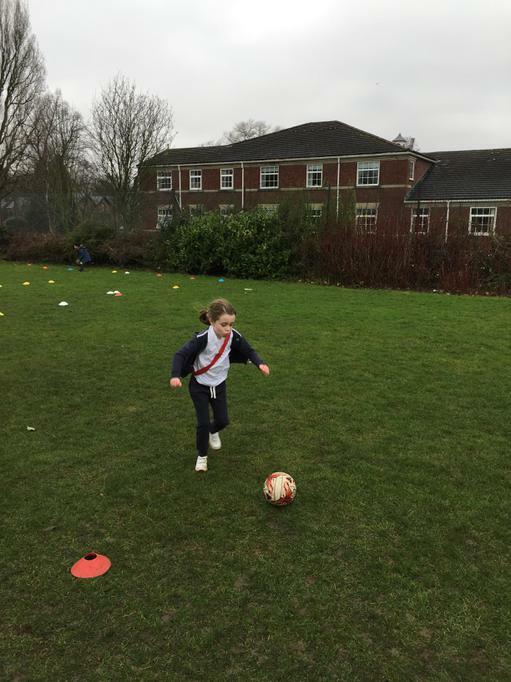 Today we had our first Year 3 and 4 football match at Stamford Park Junior School. 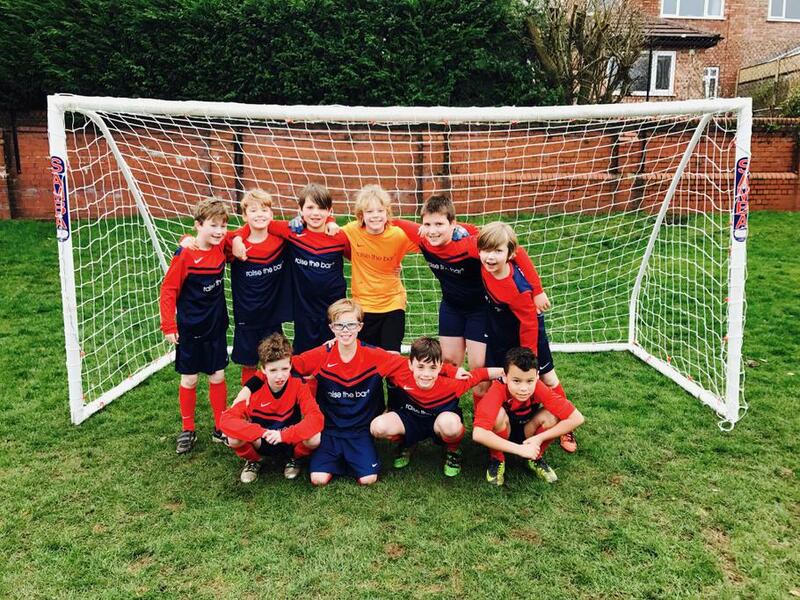 Following on from the Year 6 children setting up their own football club for the younger children, we had a very successful time.The final score against The Willows was an astounding 6 - 1. Many thanks to the parents that came to support and to The Willows - we hope to do it again in the summer! 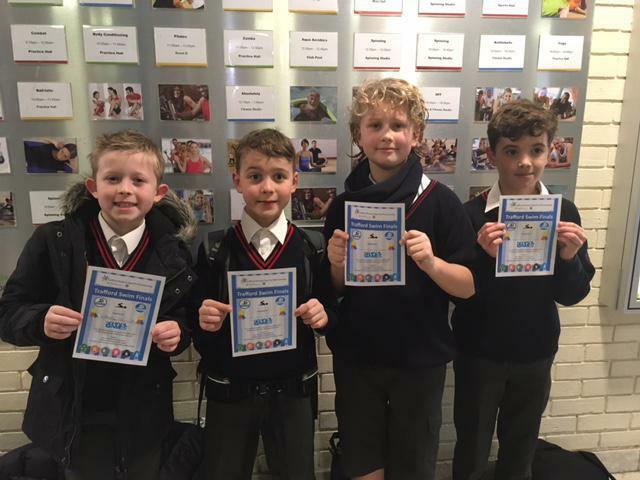 Today, our Year 5 swimming team took part in the Trafford Swimming Finals at Sale Leisure Centre, after progressing through from the first round a few weeks earlier. The boys did really well and came in at a tremendous fourth place out of the eleven teams that took part. A huge congratulations to all of them and thank you to the families that came to support at this event. 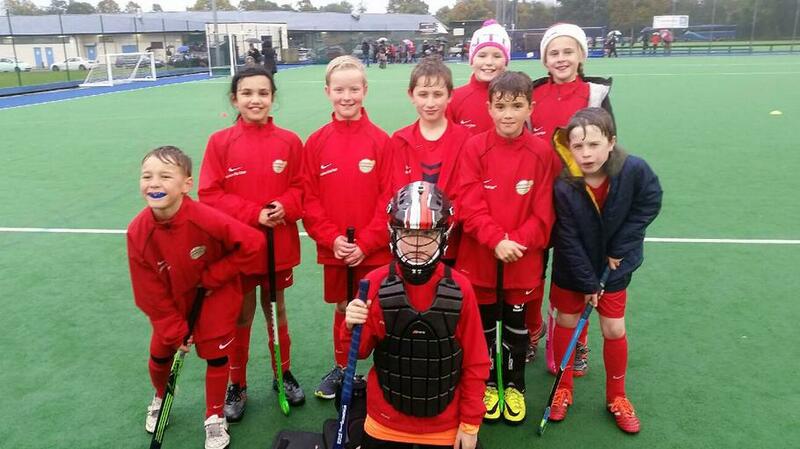 This afternoon, our Year 5 and 6 children attended the 3rd hockey tournament of the year at Timperley Sports Club. It was very chilly, although thankfully the rain held off. Unfortunately we lost our 1st 2 games against St Hughes and St Josephs, but we won our last game against Broomwood. The children played well together; both the defence and forwards dug in deep, trying hard. Well done. The next games will be on Tuesday 21st February. 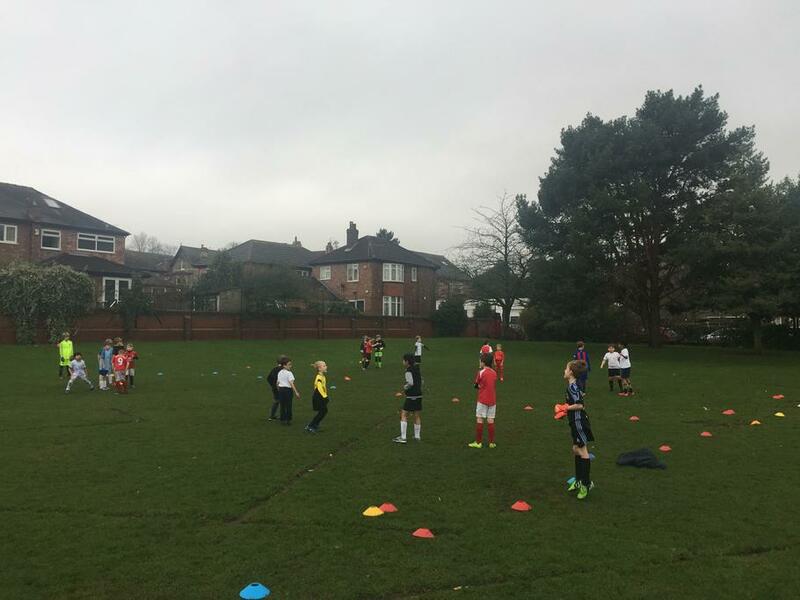 Today our new Year 6 football coaches held a football trial for Year 3 and Year 4 children. 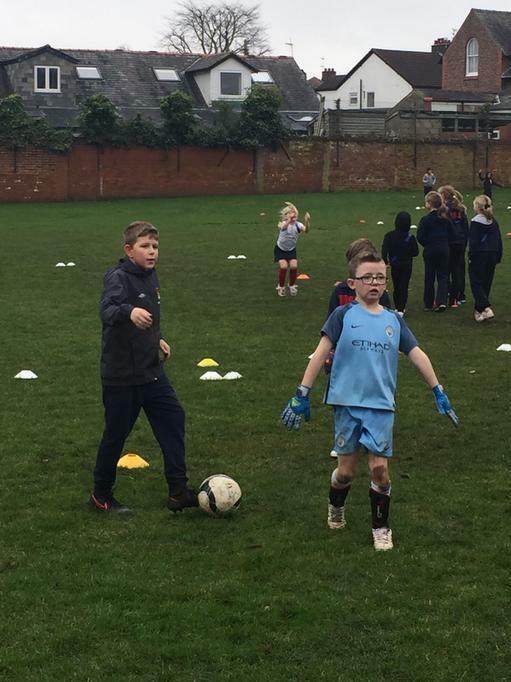 Over seventy children attended the trial and the football coaches certainly tested their skills using a range of warm ups and matches too. They've now got the tricky task of selecting their squads over the coming days, before starting off their weekly practices ready for some matches! 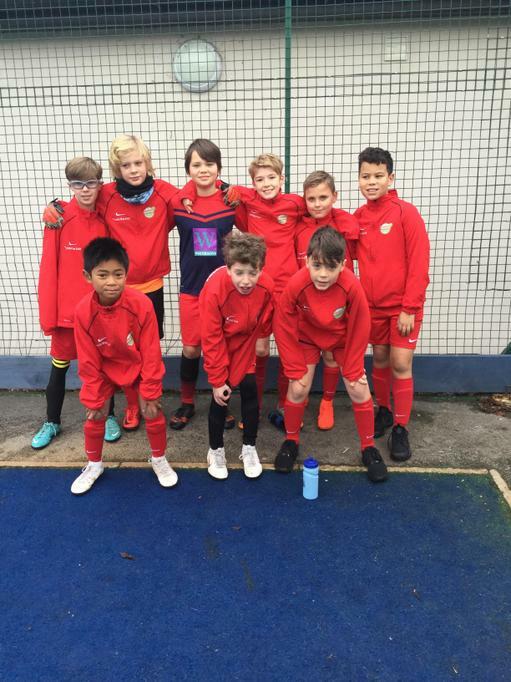 On the afternoon of Friday 9th December, we sent a Year 5 and a Year 6 football team to participate in the annual Altrincham Football Club tournament, held at Altrincham Grammar School for Boys. Mr Odell reported that both teams played superbly during the entire tournament, scoring some fantastic goals. 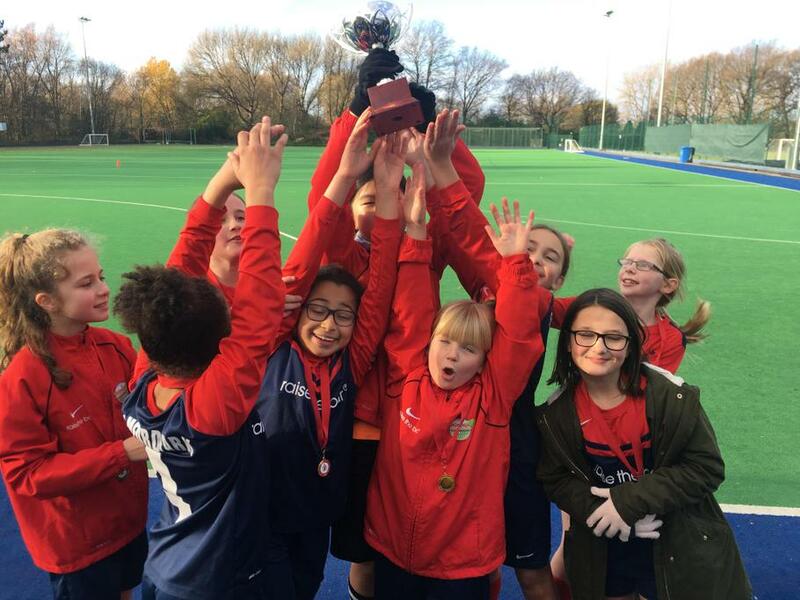 Year 6 sadly lost out in the final to Broadheath Primary (who scored an impressive golden goal), while Year 5 won all their matches to bring home an impressive shield! Well done to all the players. A group of Year 3 children have been participating in weekly tennis sessions at Hale Lawn Tennis Club. 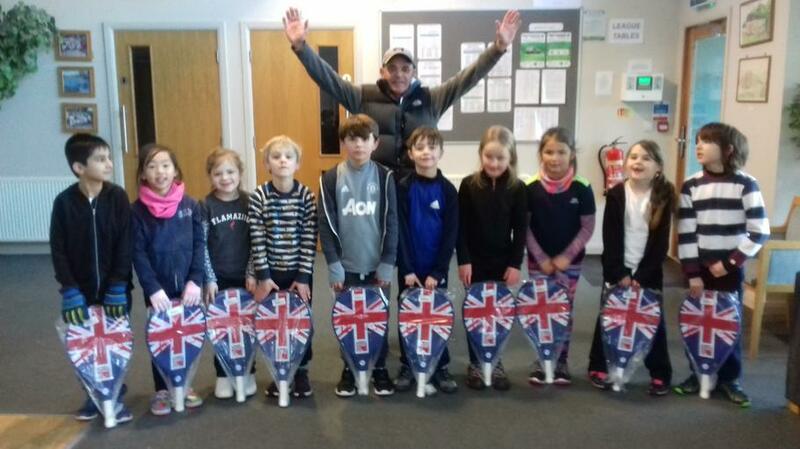 These sessions were aimed at children who had previously had very little experience of playing tennis, as part of a scheme run by the Davis Cup. To recognise their commitment and progress, they were all presented with a tennis racket last week by Mark Furness (the coach). Last night the children played the 2nd tournament of the season at Timperley Sports. The children played extremely well together and really work as a team. There were some superb saves by Seb, who remained calm when losing a boot too! The 1st game was against Navigation, which we won 2-0. We drew our 2nd (very intense) game against Park Road and lost the final game against Springfield; this was a friendly however you would not have known that watching both teams! Thank you to the parents who braved the cold and 'wet rain'. Well played team! 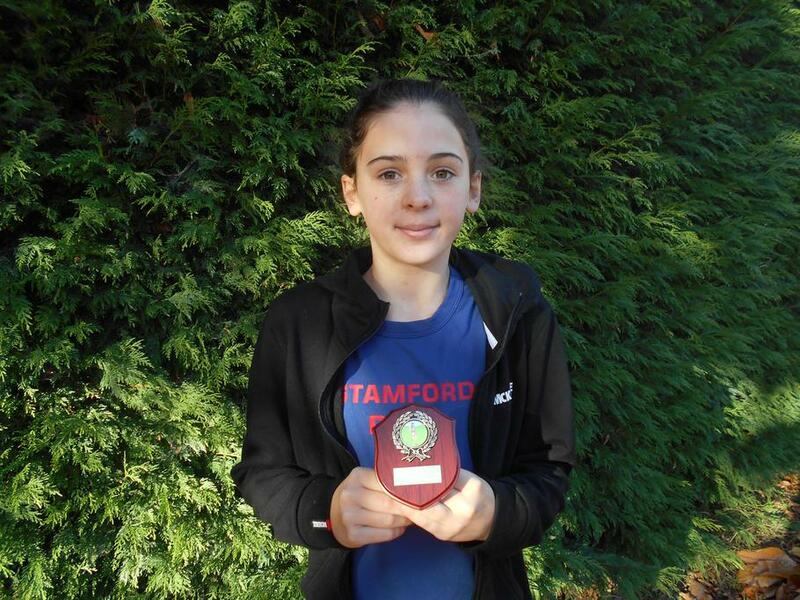 Congratulations to one member of our cross country team for coming second in the Altrincham and District Schools cross country league. This is a great achievement, as there were over seventy children in each race. The presentation of the award was made after the final race at John Leigh Park. Good luck to the whole team is all their races to come at Sale Harriers. Today was the 1st of this year's (year 5 and 6) hockey tournaments at Timperley Sports. The weather was a typical Manchester hockey night (rain, rain and more rain! ), however the children did not let this dampen their spirits and carried on. They played very well together as a team and I am sure that we will have a great season. We won 2 (3-0 Bowdon, 7-0 Forest Gate) and lost 1 (1-0 Springfield), although the final score did not reflect the possession and grit from SPJS. Well done team, a fantastic start! Thank you also to the parents who braved the cold and rain with me. 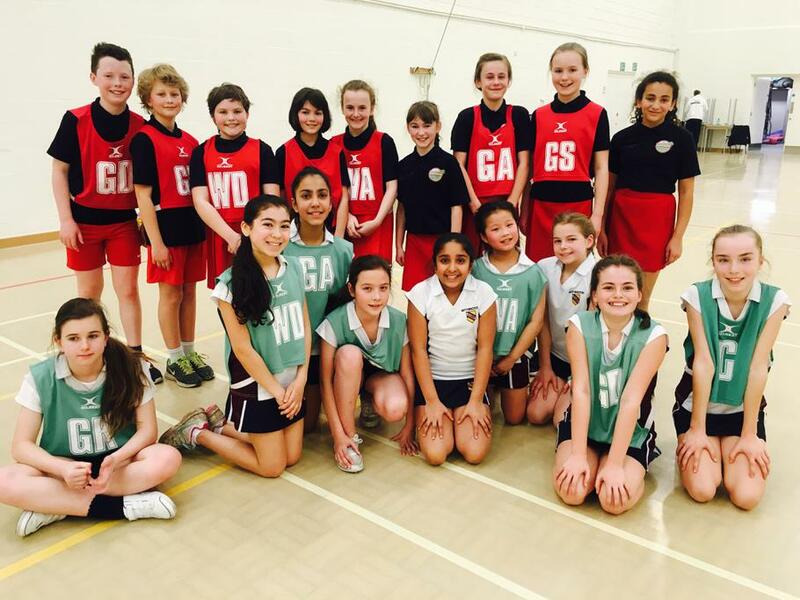 Our Year 6 B team took part in a netball match against St Vincent's Catholic Primary School. 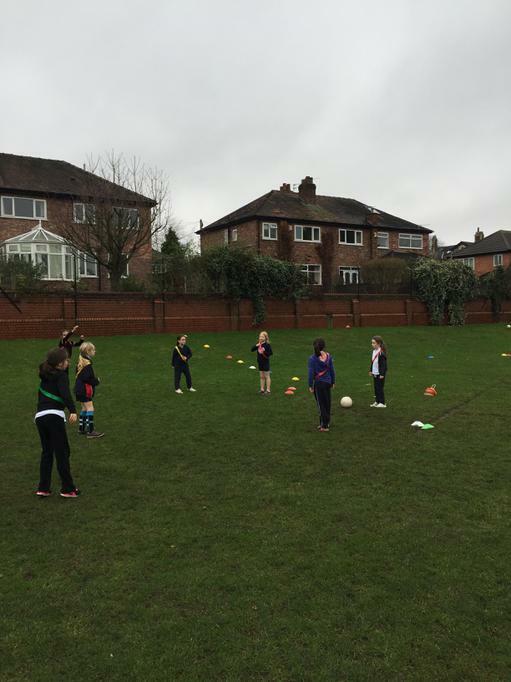 They've been training hard with Suzanne, our fantastic netball coach from Trafford Netball. The girls won the match 4-1 - a huge congratulations to all of them! 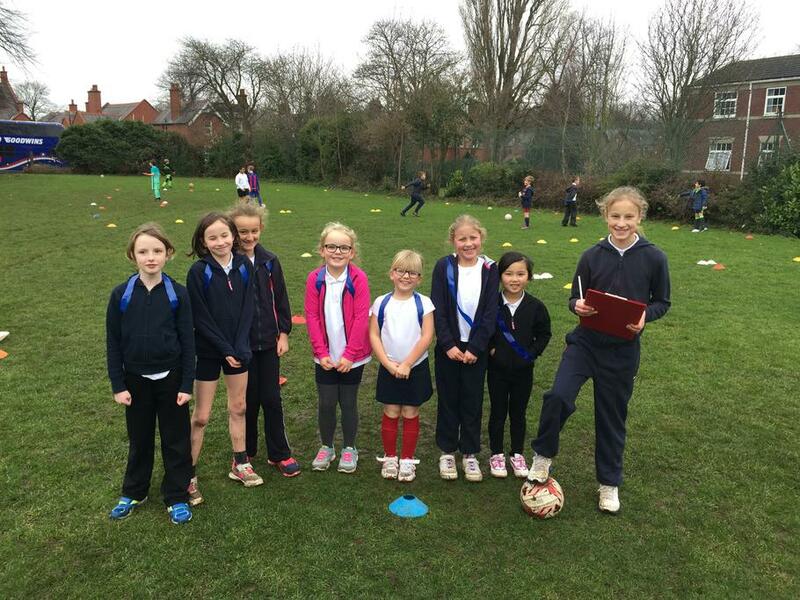 7 girls, from Years 5 and 6, participated in a 6-a-side football tournament at Wellington. They played brilliantly, coming second in their group to reach the semi-finals and came third overall. Well done to all the girls who took part. 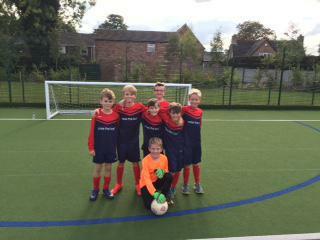 Year 6 boys played in the Wellington Boys 7-a-side tournament on Tuesday 4th October. They played brilliantly but unfortunately lost 1-0 in the final to The Bollin. Well done to all the boys who took part in this event.